Again, we call the court into session as the Internet makes its case for being a vitally important frontier for the billiard industry and anyone interested in pool. The lawyers present Exhibit 1 - a Google search for "billiards" producing over 28 million results. The next item, marked as Exhibit 2, shows Yahoo! "billiards" search page indicating it has over 47 million results. Numbers like these are evidence that although our sport involves little technology, a significant and quickly growing amount of billiard commerce is conducted over the Web, and that the Internet has become an invaluable tool for learning and communicating about the game. The verdict is in: Things are changing fast, folks, and you'd better keep up. With that in mind, we present our seventh annual BD Web Awards feature, honoring top-notch sites that set examples for our industry to follow. They show how to apply best practices in design, navigation, usability, and salesmanship. Our judge is Meryl K. Evans, a technical writer and journalist who covers Internet issues for dozens of publications. She examined hundreds of candidates to compile this year's top sites. The usual caveats apply. Winners from 2006 and 2007 aren't eligible this year. With millions of pool sites out there, we might miss a few shining stars. Let us know about any sites that deserve serious consideration in the future. "Simple" and "sophisticated" first come to mind when landing on Jeanette Lee's recently redesigned site. Successful Web sites for players typically include bios, touring schedules, news, and contact information. Finding all of these comes easy in the site's well-designed navigation. Her Gallery not only contains a wealth of high-quality, fashion-style photos, but you also can watch her in action in videos. She also has a fan page with tips and tricks, but the section requires that you request access. Stefano Pelinga's site, like Lee's, exudes elegance and cool. Right away, you know where to find whatever you need. Pelinga's site has everything Lee's does plus a page of press clippings. It misses top honors because of the constant and distracting animation - legions of balls that float across the background - and use of frames (an outdated technology for scrolling through information) in some of its pages. Locals flock to poolroom sites to find out their hours, study their menus and look up special events. 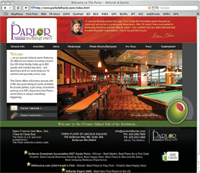 The Parlor Billiards and Spirits gives you exactly what most people need to know as soon as they land on the site: its hours, address and phone number. The design looks classy, and the slowly changing photo slide show uses gorgeous photos along with a brief caption describing the room. In short, The Parlor's site has everything you need and more, including a virtual tour of its main and private rooms, a section for press clippings, and the ability to buy gift cards online. We hope they fill their Events Calandar page soon, as many of us would like to know what's coming. 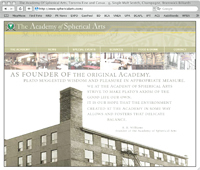 The Academy of Spherical Arts, based in Toronto, shares its history with us on its site, detailing how the building started out as a manufacturing plant for billiard tables and accessories. It's hard to resist a smile when reading, "It is a poetic and comforting thought to know that many of the billiard tables, cues, balls and scoreboards that were handcrafted here decades ago have returned at long last to their place of birth. All's right with the world." The site lists its upcoming events (updated, unlike many sites); available services, including Internet connectivity and audio/video equipment; detailed menus; and drink tastings schedule. The Academy is clearly trying to court business and social events, and the amount of related information on the site is impressive. Some disappointments: The pop-up menus and light-colored text held back the site.